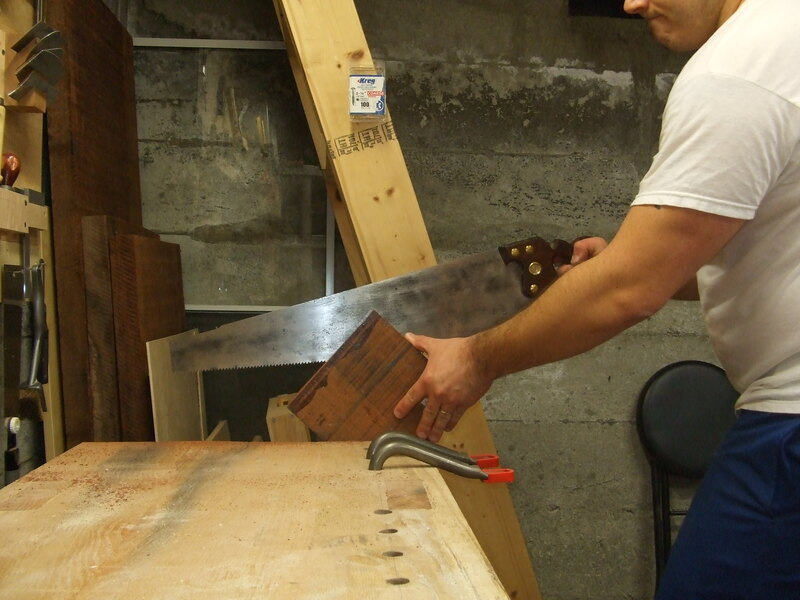 I often find myself needing to resaw large slabs of wood efficiently in my shop, and since I love my rip saws, its only natural that this is the tool I choose to accomplish that task. Resawing is, technically speaking, sawing a piece of timber along the grain to reduce it in thickness. Common resawing operations are making veneer from a board, sawing a thicker board in half for book matching or, as in my case, cutting a single 2 inch thick chunk into two 1 inch thick slabs for handle blanks. 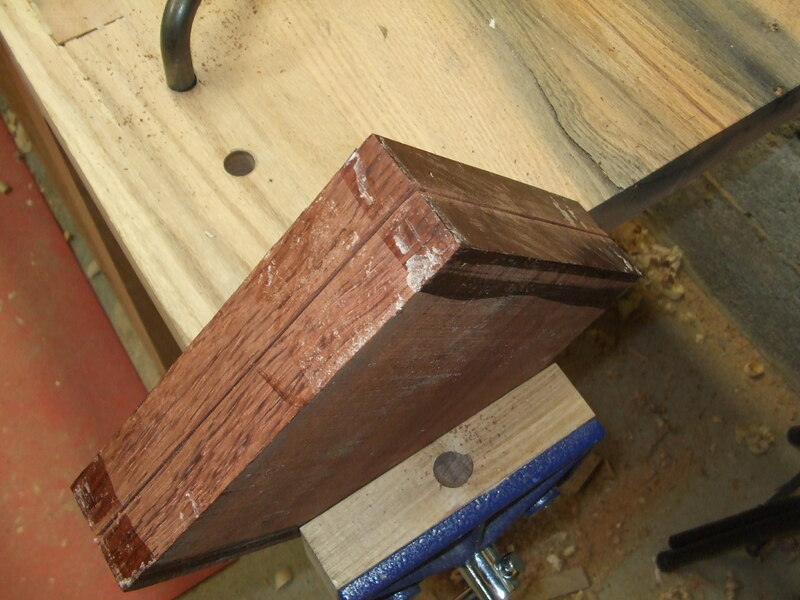 I selected a nice piece of bubinga, about 8 inches by 8 inches by 2 inches thick, so that by resawing it, it becomes two very usable pieces…I could get two full size hand saw totes out of them, or, with efficient layout, maybe even four back saw totes (two from each piece). 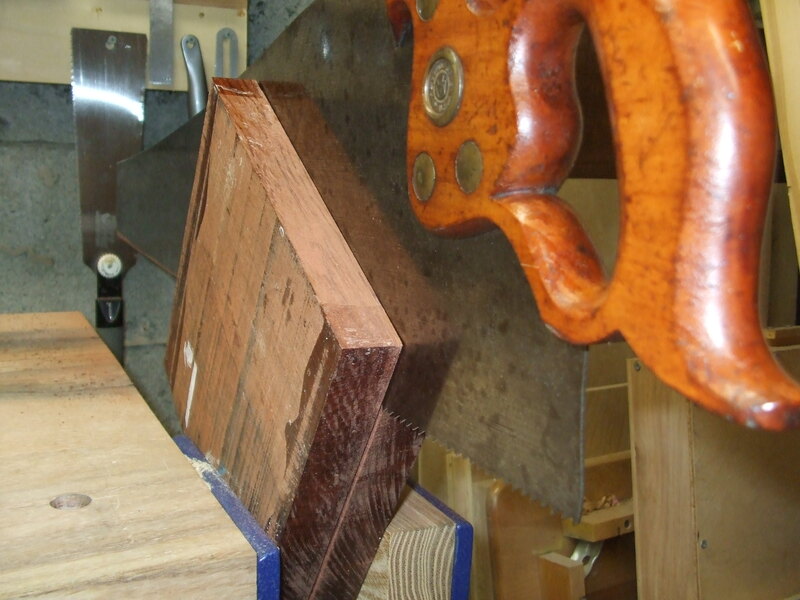 Bubinga is a realtively hard, dense, and tough wood….resawing it should be fun! The first step before I start actually sawing is layout. And like all good work, the layout is critical. It’s very difficult to just clamp up the blank and start sawing, praying with each stroke that you stay square…that’s a real crap shoot (and I’m no where near good enough a sawyer to keep it straight anyway!) So, the trick is to use a marking gauge and scribe a line all the way around the blank along the center of its thickness to mark where your saw will cut. Now I place the blank in my tail vise with one edge parallel to the bench top (it doesn’t matter which edge). In order to keep the saw tracking straight and square, you need to create a saw kerf all the way around the blank along the scribe lines. This will guide the saw blade as it cuts and ensure that it is tracking true in both dimensions. Without doing this crucial step first, as I mentioned above, it’s real crap shoot. Next, I rotate the blank forward by 90 degrees and perform the same step all around the four sides of the blank. The fourth kerfing cut should join the first and third and each kerf should meet at the same point…right in the middle of the thickness of the blank. 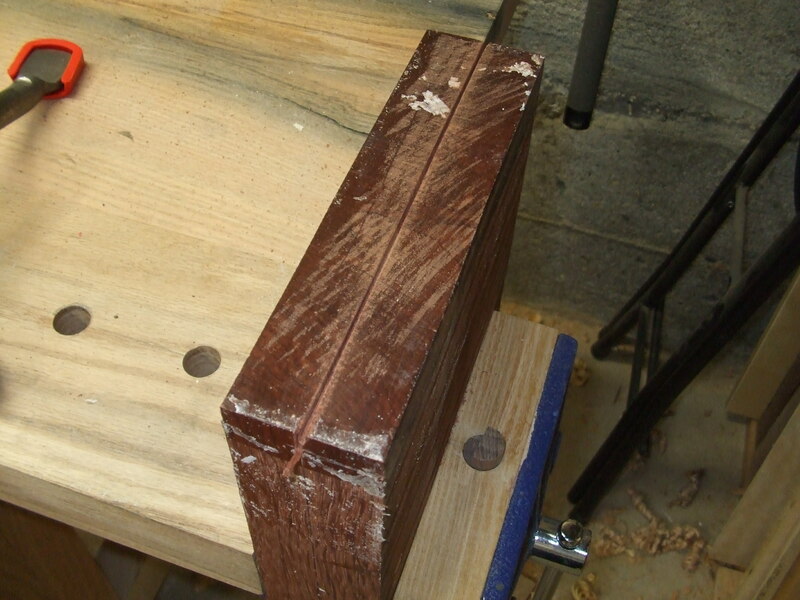 With all four sides kerfed in, now I rotate the blank 45 degrees in the vise and clamp it down so that one corner is pointing up…. The next step is to treat the blank like a giant mortise and ‘saw out the corner’ as Adam Cherubini likes to say. With the two kerfs started on each side, the saw plate will guide itself with little effort and cut true as a plumb bob. I switch to a full size D-8 rip saw (thank you daryl!) at this point and start with, once again, gentle sweeps of the saw. I always let the saw do the work, especially at this point. The key here, is to align your eye so you can see the saw plate staying on line with the front and the back kerfs…that’s how you know you’re sawing true. Once I’m an inch or two into the kerf, I can start to really pump my arm back and forth to speed the cut….I always keep an eye on the front and back kerf to ensure I’m staying straight, but at this point, the saw pretty much stears itself. Once I reach just shy of the half-way point, it’s a simple matter of flipping the blank 180 degrees in the vise, so that the other ‘corner’ is sticking up and repeat the previous step. Again, the key is just lining up the saw strokes with the two defined kerfs on each side and sawing away. You can see how easy it is to track the saw properly with the kerfed in corners…. A few more gentle strokes and the two pieces are free! So there you have it….resawing the old fashioned way. 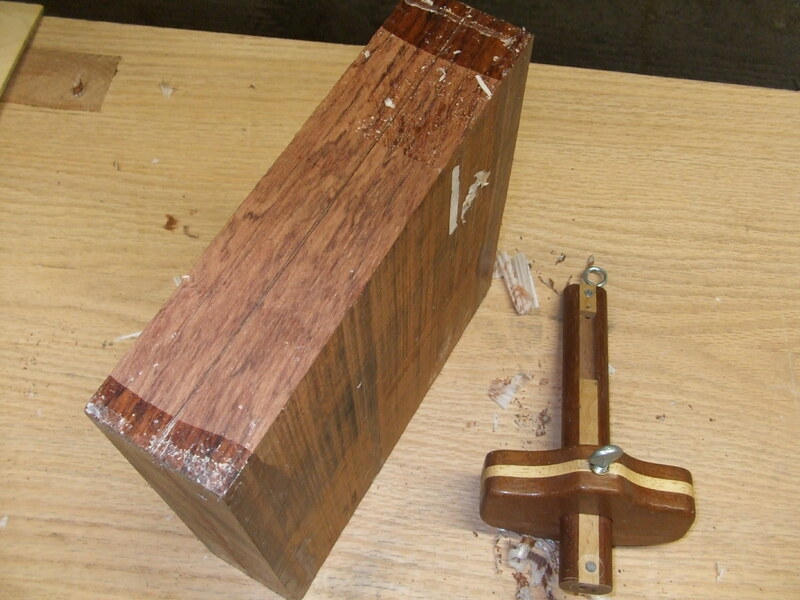 The two blanks are nice and even in thickness…with a little planing, they’ll be ready for new lives as saw totes. 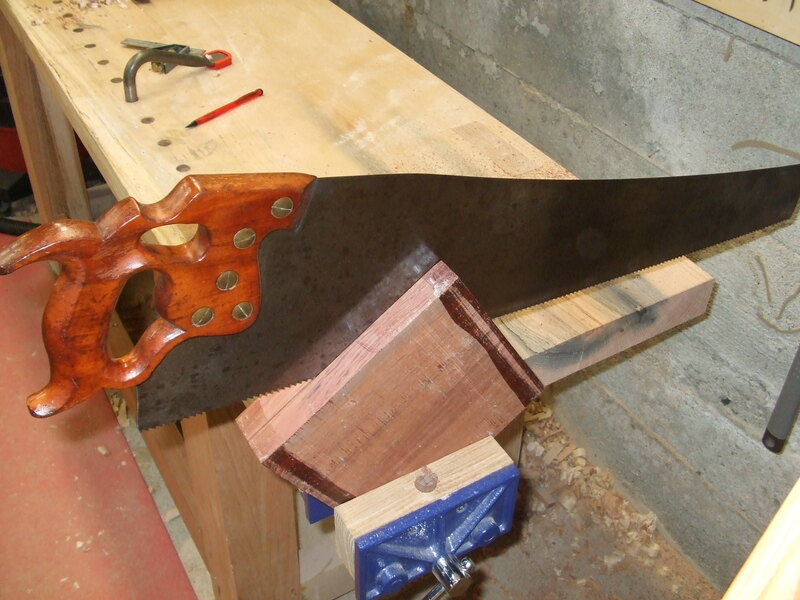 I suppose you could say the more traditional way to resaw by hand would be with a frame saw, but I much prefer this method….I can’t see using a frame saw for much of anything (sorry Frank Klaus!). Matt, I totally agree about the pleasure of moving the saw. One question, though, out of curiosity: how do you define the kerf on those initial cuts? This is something I’ve been experimenting with lately, and have yet to settle on a method (i.e., far corner or near corner first, or nearly straight across—especially tough with those bigger handsaws). p.s. don’t let Wilbur see that pull saw in the background or he may step up his efforts to recruit you for the dark side. I start the kerf with the saw at a low angle and resting on the far corner of the blank. I use my thumb in the traditional manner to track the saw and draw back to define the initial kerf. Then, I lower the saw to just about parallel with the face of the blank and use forward strokes to define the kerf further. A well scribed line is key here and it gives just enough definition to keep the saw tracking in it. A few strokes is all it takes to define the kerf, and then you can saw away to deepen the kerf to desired depth. I enjoyed reading this! Good article! Great tip about kerfing in around the block of wood, how would you approach a plank that is 8 inch by 2 inch by over a few feet long? Would you consider kerfing in on this or just marking the 2 long edges? 1) You could kerf in along the 8 inch edge and kerf in along the first 12 inches or so of the long edge of the board with the rip saw. Then saw out the corner as stated above. Once you get passed the kerfed in area and you’re a good ways into the board, flip it over about every 6 to 12 inches to keep your cut true (another trick I learned from Adam Cherubini). Keep flipping and cutting until you finish the resawing. 2) The other way you could do it is use your plow plane with an 1/16th inch cutter (or the smallest you’ve got)and plow a groove around all four edges of the plank, just like above, except with the plow and not the saw. Then, start sawing as above using the grooves made by the plane. Great article! Great blog! Your suggestion of plowing a groove all around is brilliant! I enjoyed the article and the blogs. However, I must admit I am not familiar with all the woodworking terms. It seems to give you and others such pleasure, for which I am glad.